From Depths We Rise is a miraculous story of hope and overcoming...a journey of beauty from ashes, of marching toward purpose out of the pain. Rodriguez's awe-inspiring story will encourage readers of all ages to grasp tightly to their faith and to rise above even the most daunting of circumstances. 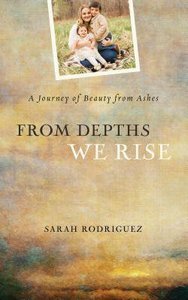 About "From Depths We Rise"
Sarah Rodriguez is a graduate of Victory Bible College in Tulsa and currently resides Oklahoma. She is a writer, a speaker, and is active in her church community through worship and other avenues of serving. She was blessed to be married to her husband Joel for 8 incredible years. She is Mommy to Milo and Ellis.